Talysman posted about his most recent version of the thief class and we have been discussing it in the comments on his blog (see here and here). This means I’ve been thinking about thieves (even) more than normal. Here are a couple of ideas that I want to get down in text. Contra thieves: does the solo nature of many thief skills make them a bad fit for an adventuring party? For example, if you have a diverse mix of classes, the thief is probably going to have to go off alone to make use of stealth. This increases the chance of splitting the party. This is true of virtually all of the thief’s abilities (even “hear noise” requires everyone else to be quiet). The one player mini-games that follow both potentially waste the time of other players and expose the thief to unnecessary danger, since the other party members will often not be around to assist. Now, the last thing that I want is to excise the thief. I like the thief. The archetype is fun to play. In fact, it has been said that in my 3E incarnation I am actually a rogue myself. But I do think this issue needs to be addressed in a well-designed thief class. Powerful spells can only be prepared by high level magic-users. Is it possible to distribute the thief’s abilities among the levels in a similar way? The traditional thief gets 7 poor abilities all at once and then has to wait for them to gradually improve. 2E, 3E, and some other systems tried to address this problem by using a point-buy system for thief skills, but that does not satisfy me because it adds complexity, calculation, and the opportunity overly optimize (i.e., min-max). Why not give the thief one awesome ability per level rather than 7 crappy ones? Are there some abilities that more naturally fit low level play? The pair of stealth abilities (hide in shadows & move silently) are basically invisibility, so they are clear candidates for at least the lower mid-levels. Maybe connect this to thief magic, in mechanics if not flavor? These points don’t make much sense together. But there you have them. This entry was posted in Uncategorized and tagged thief on December 21, 2011 by Necropraxis. 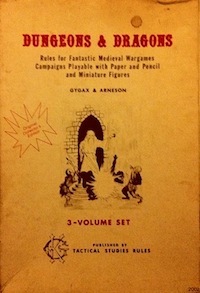 One interesting idea is put forward in the DMG (p. 61), which is that “Surprise is determined by rolling a six-sided die for each party concerned, modifying the result by using the most favorable member of the party concerned, i.e. a ranger, surprised only on a roll of 1 , will represent the whole of a group of other character types.” I kind of like the idea that a thief’s successful “move silently” roll improving the surprise chances of the whole party. Interesting; it’s like extending the idea of party initiative to stealth. It might require some suspension of disbelief, but I suppose you could rationalize it as the thief instructing other party members in proper movement and armor handling. Such a rule might invite some degree of exploitation though (e.g. the party of fighters in plate that take a thief along to get the stealth), and so would probably require some degree of social contract between players and referee. But then, what doesn’t?